5SOS’ Michael Clifford suffered burns to the head during an on-stage accident while performing in London on June 13. The guitarist later tweeted that he’s “feeling loads better”. Five Seconds of Summer had to stop their concert at Wembley Arena after his hair and face were burnt by pyrotechnics. Michael Clifford, 19, was treated in hospital and later posted a picture of his face in bandages. 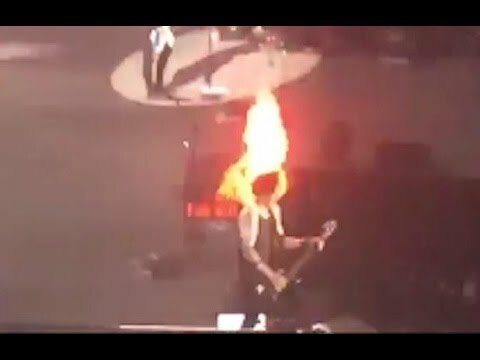 Videos show the guitarist rushing to the side and putting flames out with a towel before leaving the stage. 5SOS were due back on stage at Wembley on June 14 and Ashton Irwin confirmed that the concert will go ahead as planned.